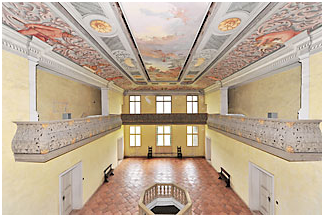 With its octagonal balcony opening on the ceiling, justified by its musical functions, this is a unique and extraordinary room. 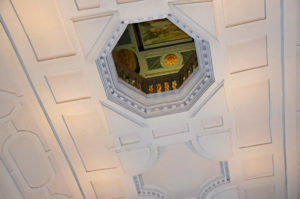 In fact, this room is also known as the room of the upside down guitar, for its function similar to that of a sound box; the music played by musicians sitting in the four balconies reflects on the ceiling and is propagated to the room beneath through the octagonal opening. 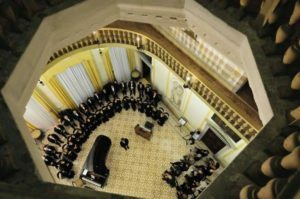 The resulting perfect acoustics make this hall the ideal for chamber concerts. For exquisite 17th century plaster casts representing the four Seasons are placed in the niches. The portraits of some of the old owners of the Villa of Piazzola can be seen over the doors. Among them, visitors can recognize Marco Contarini, the deviser of the 17th century enlargements of the Villa, celebrated with an inscription reading: ” MARCUS CONTARENUS DIVI MARCI PROCURATOR PETRI FILIUS PLATEOLAE AMPLIATOR 1660″; other portraits show Francesco Contarini and Francesco Novello da Carrara, who gave the estate to his brother Jacopo in 1391; on the right-hand side there are Maria da Carrara, Jacopo’s daughter, her husband Nicolò Contarini, and their heir Zaccaria. 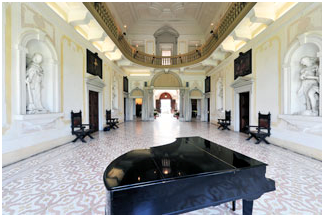 The hall overlooks the back garden of the Villa and allows enjoying a view of the vast park.